Wang, S., Madsen, C. D. and Wu, Y. (2018). Measurement of Mesenchymal Stem Cells Attachment to Endothelial Cells. Bio-protocol 8(6): e2776. DOI: 10.21769/BioProtoc.2776. Mesenchymal stem cells (MSCs) have shown profound therapeutic potential in tissue repair and regeneration. However, recent studies indicate that MSCs are largely entrapped in lungs after intravenous delivery and die shortly. The underlying mechanisms have been poorly understood. We have provided evidence to show that excess expression and activation of integrins in culture-expanded MSCs is a critical cause of MSCs adhesion to endothelial cells of the lung microarteries resulting in the entrapment of the cells (Wang et al., 2015). Therefore, it may be meaningful to test the adhesive ability of MSCs to endothelial cells in vitro before intravenous administration to avoid their lung vascular obstructions. Here we report a simple method to measure MSCs attachment to endothelial cells. Mesenchymal stem cells (MSCs) are emerging as an extremely promising therapeutic agent, and numerous clinical trials for a variety of diseases are underway (Salem and Thiemermann, 2010). Intravenous infusion of MSCs has been a popular delivery route for MSCs therapies in recent clinical trials because of its convenience and safety (Wu and Zhao, 2012). However, increasing evidence has indicated that MSCs cause considerable vascular obstructions following intravascular injection. 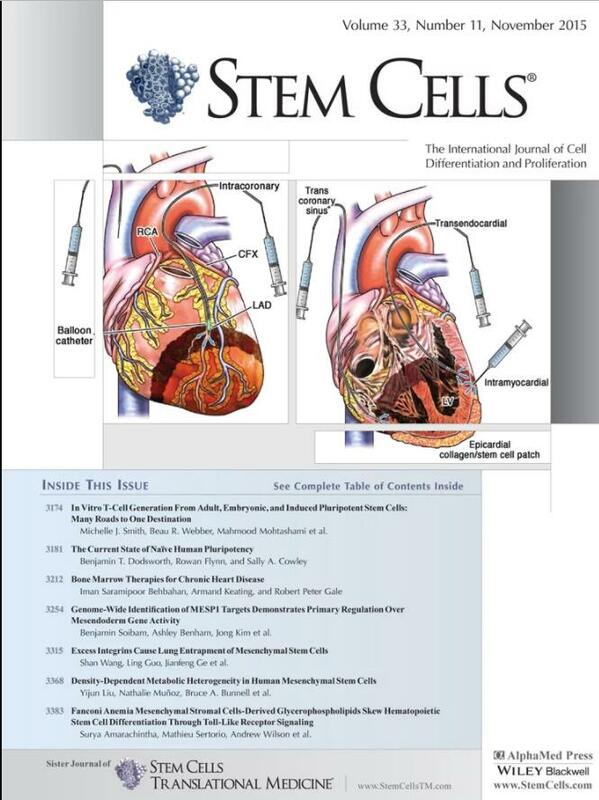 Upon intravenous infusion, more than 80% of MSCs are entrapped in the lungs, and only less than 1% of MSCs are detected in the acute ischemic heart or brain (Lee et al., 2009; Toma et al., 2009). Recent studies suggest that MSCs are largely stuck in the precapillary microvessel after intravenous administration and most of them die shortly of local ischemia (Toma et al., 2009). Therefore, it has become an increasing concern over the safety and efficacy of intravascularly administered MSCs. The mechanisms of vascular obstructions of MSCs have not been fully understood. Our data have indicated that excess expression of integrins in MSCs is an important cause for their lung entrapment, which leads to attachment of the cells to endothelial cells in the lungs, thus reducing their trafficking and homing to inflamed tissues. Functional blockade of integrins in MSCs, especially after integrin β1 blockade, significantly decreases their attachment to endothelial cells, resulting in a substantial reduction of MSCs entrapped in the lungs, elevated levels of circulating MSCs in the blood, and increased engraftment of the cells to inflamed tissues (Wang et al., 2015). Here we provide a methodology for measuring the attachment of MSCs to endothelial cells in vitro. Human bone marrow-derived MSCs (hMSCs) were purchased from Lonza. Culture hMSCs in a growth medium consisting of DMEM, 10% FBS, and 1% penicillin and streptomycin for 72 h.
Culture HUVECs in endothelial growth medium (EGM)-2 plus 2% FBS and supplements for 72 h.
Culture HMVECs-L in EGMTM-2 MV BulletKitTM Medium for 72 h.
Note: EGMTM-2 MV BulletKitTM Medium includes endothelial basal medium-2 (EBM-2, Lonza) and the following growth supplements: human epidermal growth factor (hEGF); vascular endothelial growth factor (VEGF); R3-insulin-like growth factor-1 (R3-IGF-1); ascorbic acid; hydrocortisone; human fibroblast growth factor-Beta (hFGF-β); fetal bovine serum (FBS) and gentamicin/amphotericin-B (GA). Coat 24-well plates with 10 μg/ml fibronectin (diluting in sterile HBSS or PBS solutions) or 0.4-1 μg/ml vitronectin (diluting in sterile water) for 1 h at room temperature. Remove fibronectin or vitronectin buffer without washing, air dry for 1-2 h in a hood. Block the plates with 3% BSA in PBS for 1 h at 37 °C. Gently wash the plates with PBS once, air dry in a hood. Use 3% BSA in PBS alone-coated wells as a negative control. Pre-label hMSCs and freshly isolated human peripheral blood leucocytes with fluorescent label DiI (Lipophilic fluorophore 1,1’-dioctadecyl-3,3,3’,3’-tetramethylindocarbocyanine perchlorate) (Wu et al., 2006). For cells in suspension, wash with PBS and incubate with DiI at a concentration 2 μg/ml in DMEM basal medium (serum-free) for 20-30 min at 37 °C. Then incubate with fresh growth medium (DMEM supplemented with 10% FBS) for 30 min. After two washes with PBS (400 x g, 5 min), re-suspend the cells in fresh growth medium. For cells in adhesion, wash with PBS and incubate with DiI at a concentration of 2 μg/ml in DMEM basal medium (serum-free) for 20-30 min at 37 °C. Then replace the medium with fresh growth medium and incubate for 30 min. Trypsinize the cells with 0.25% trypsin-EDTA for 2 min and suspend cells in DMEM supplemented with 10% FBS. Pre-incubate hMSCs in suspension with different concentrations of integrin β1, integrin α5 or integrin αVβ3 blocking to determine the lowest concentrations of the blocking antibodies that achieve maximum inhibition to hMSCs attachment (Wang et al., 2015). Incubate hMSCs with anti-integrin β1 blocking mAb at concentrations of 0, 2, 4, 6, 8, 10 and 20 μg/ml in DMEM containing 2% FBS for 30 min at 37 °C. Incubate hMSCs with anti-integrin α5 blocking mAb at concentrations of 0, 2.5, 5, 10, 20 and 40 μg/ml in DMEM containing 2% FBS for 30 min at 37 °C. Incubate hMSCs with anti-integrins αVβ3 blocking mAb at concentrations of 0, 2.5, 5, 10 and 20 μg/ml for 30 min at 37 °C. Incubate hMSCs with isotype IgG antibody as a control. Wash once with PBS after incubations. Seed 5 x 104 per well of hMSCs after blockade with integrin β1, integrin α5 or isotype control IgG, or 5 x 104 per well freshly isolated human peripheral blood leucocytes on fibronectin-coated plates. Seed 5 x 104 hMSCs per well after blockade with integrin αVβ3 or isotype control IgG on vitronectin-coated plates. Incubate the cells in DMEM plus 10% FBS for 30, 60, 90 and 120 min at 37 °C. Collect non-adherent cells every 30 min (wash once with PBS). Centrifuge non-adherent cells at 400 x g, 5 min. Count the non-adherent cells with a hemocytometer. Photograph the DiI-labelled hMSCs in attachment by fluorescence microscopy. The experiment must be performed in quadruplicate for each variable. Culture HUVECs and HMVECs-L in 12-well plates with endothelial growth medium (EGM)-2 and EGMTM-2 MV BulletKitTM Medium, respectively, to confluence. The confluence density is approximate percentage of 80%-90%. Cells were treated with or without of 10 ng/ml TNF-α for 24 h immediately before the addition of hMSCs or leucocytes. TNF-α treatment, which is able to activate endothelial cells (Ko et al., 2009), increased the attachment of hMSCs and leucocytes to endothelial cells. Isolate leucocytes from freshly human peripheral blood (Boyum, 1976; Chacko et al., 2013). Prepare hMSCs: trypsinize hMSCs from 80%-90% confluent 10 cm plates. Label hMSCs and leucocytes with fluorescent DiI. Suspend DiI-labeled leucocytes at a density of 1 x 106 in M199 plus 0.1% BSA. Suspend DiI-labeled hMSCs at a density of 0.5 x 106 in DMEM plus 0.1% BSA. Find out the appropriate time-point to detect hMSCs attachment to endothelial cells. Add DiI-labeled hMSCs to 80%-90% confluent monolayers of HUVECs and HMVECs-L in 12-well plates and incubate cells at 37 °C and 5% CO2. Detect hMSCs attached to endothelial cells every 15 min for 60 min. Incubation for 30 min is normally sufficient for strong adhesion of hMSCs to endothelial cells. Incubate hMSCs which have been treated with blocking antibodies against integrin β1 at 4 μg/ml, integrin α5 at 10 μg/ml, integrin αVβ3 at 5 μg/ml, or control IgG at 10 μg/ml for 30 min at 37 °C. Wash samples once with PBS. Re-suspend samples with fresh growth medium and incubate for 30 min at 37 °C. Add cells to 80%-90% confluent monolayers of HUVECs or HMVECs-L in 12-well plates. Incubate culture seeded with leucocytes for 1 h, and culture seeded with hMSCs for 30 min. Wash the cultures twice with HBSS to remove non-adherent cells. Fix the adherent cells with 1% PFA. Acquire images of adherent cells under a fluorescence microscope (200x), and 10 fields per well were imaged (Figure 1). Count the number of cells per field. Six duplicate wells are used for each condition. Figure 1. 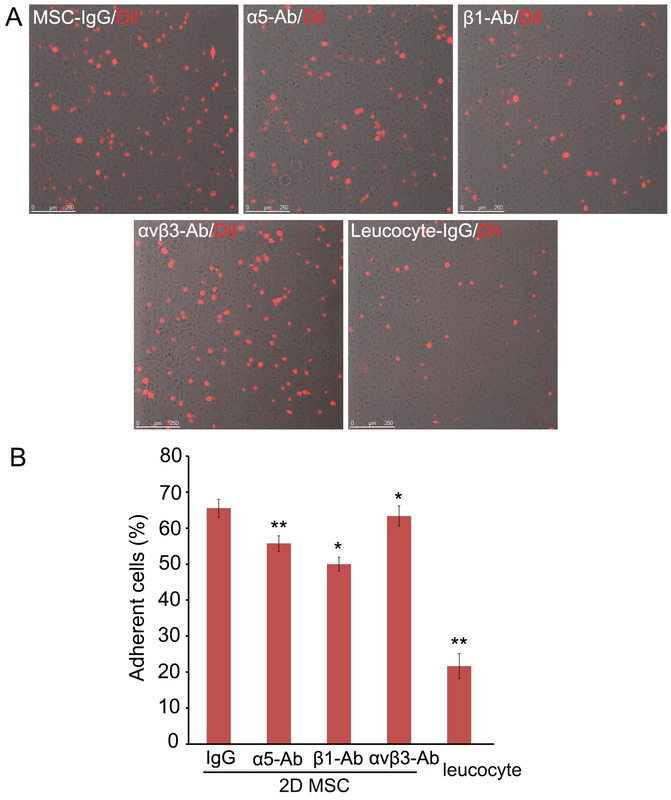 Adhesion of hMSCs to HMVEC-L. A. DiI-labeled single hMSCs derived from monolayers (2D) were pre-incubated with blocking antibodies against integrin α5, integrin β1, or integrin αVβ3, seeded on HMVECs-L monolayers and incubated for 30 min. hMSCs and leucocytes pre-incubated with isotype IgG were used as controls. Scale bars = 250 µm. B. The non-adherent cells were removed and counted, and the adherent DiI-hMSCs were photographed. Six replicate wells were used for each condition, and the experiment was repeated three times, * P < 0.05; ** P < 0.01. Abbreviation: MSC, mesenchymal stem cells. Adherent cells (%) = (number of attached cells)/[total cell number] x 100%. The lowest concentrations of the blocking antibodies that achieved maximum inhibition to hMSCs attachment were chosen for experiments: integrin β1 at 4 μg/ml, integrin α5 at 10 μg/ml, and integrin αVβ3 at 5 μg/ml. Incubation for 30 min was the best time point for detection of hMSCs attachment to endothelial cells. Shorter incubation reduced the number of hMSCs in attachment, but longer incubation did not increase the number of hMSCs attached to endothelial cells. Pre-incubation with blocking antibodies against integrin β1, integrin α5, or integrin αVβ3 significantly decreased the number of hMSCs attached to the endothelial cells (P < 0.05), with integrin β1 blockade resulting in the most evident reduction (by ~40%). The non-adherent cells were analyzed using Dead Cell Apoptosis Kit by flow cytometry. At the above concentrations, blockade of integrin β1, but not integrin α5 nor integrin αVβ3 caused a modest increase of hMSCs apoptosis (2-3%) (P < 0.05). Our in vitro attachment experiments showed that functional blockade of these integrins in hMSCs significantly reduced their attachment to endothelial monolayers, but there were still more hMSCs attached to endothelial cells than leucocytes did. These results suggest that more adhesive molecules may be involved in hMSCs attachment to endothelial cells (Schenkel et al., 2004; Wang et al., 2015). We detected fibronectin, the major ligand of integrin α5β1, and vitronectin, the major ligand of integrin αVβ3, on cultured HMVECs-L and the normal endothelium in lungs. Note: Leucocytes were isolated from the whole peripheral blood using Ficoll-paque Plus solution. This protocol was adapted from previously published papers (Luu et al., 2013; Wang et al., 2015; Wu et al., 2006). This work was supported by grants from the National Natural Science Foundation of China Natural Science Foundation of China (Nos. 31371404, 31571429), Natural Science Foundation of Guangdong (2015A030311041), and Shenzhen Science and Technology Innovation Committee (JCY20160301150838144). Disclosure of potential conflicts of interest: The authors indicate no potential conflicts of interest. Bartosh, T. J., Ylostalo, J. H., Mohammadipoor, A., Bazhanov, N., Coble, K., Claypool, K., Lee, R. H., Choi, H. and Prockop, D. J. (2010). Aggregation of human mesenchymal stromal cells (MSCs) into 3D spheroids enhances their antiinflammatory properties. Proc Natl Acad Sci U S A 107(31): 13724-13729. Boyum, A. (1976). Isolation of lymphocytes, granulocytes and macrophages. Scand J Immunol Suppl 5: 9-15. Chacko, B. K., Kramer, P. A., Ravi, S., Johnson, M. S., Hardy, R. W., Ballinger, S. W. and Darley-Usmar, V. M. (2013). Methods for defining distinct bioenergetic profiles in platelets, lymphocytes, monocytes, and neutrophils, and the oxidative burst from human blood. Lab Invest 93(6): 690-700. Guo, L., Zhou, Y., Wang, S. and Wu, Y. (2014). Epigenetic changes of mesenchymal stem cells in three-dimensional (3D) spheroids. J Cell Mol Med 18(10): 2009-2019. Ip, J. E., Wu, Y., Huang, J., Zhang, L., Pratt, R. E. and Dzau, V. J. (2007). Mesenchymal stem cells use integrin β1 not CXC chemokine receptor 4 for myocardial migration and engraftment. Mol Biol Cell 18(8): 2873-2882. Ko, I. K., Kean, T. J. and Dennis, J. E. (2009). Targeting mesenchymal stem cells to activated endothelial cells. Biomaterials 30(22): 3702-3710. Lee, R. H., Pulin, A. A., Seo, M. J., Kota, D. J., Ylostalo, J., Larson, B. L., Semprun-Prieto, L., Delafontaine, P. and Prockop, D. J. (2009). Intravenous hMSCs improve myocardial infarction in mice because cells embolized in lung are activated to secrete the anti-inflammatory protein TSG-6. Cell Stem Cell 5(1): 54-63. Luu, N. T., McGettrick, H. M., Buckley, C. D., Newsome, P. N., Rainger, G. E., Frampton, J. and Nash, G. B. (2013). Crosstalk between mesenchymal stem cells and endothelial cells leads to downregulation of cytokine-induced leukocyte recruitment. Stem Cells 31(12): 2690-2702. Salem, H. K. and Thiemermann, C. (2010). Mesenchymal stromal cells: current understanding and clinical status. Stem Cells 28(3): 585-596. Schenkel, A. R., Mamdouh, Z. and Muller, W. A. (2004). Locomotion of monocytes on endothelium is a critical step during extravasation. Nat Immunol 5(4): 393-400. Toma, C., Wagner, W. R., Bowry, S., Schwartz, A. and Villanueva, F. (2009). Fate of culture-expanded mesenchymal stem cells in the microvasculature: in vivo observations of cell kinetics. Circ Res 104(3): 398-402. Wang, S., Guo, L., Ge, J., Yu, L., Cai, T., Tian, R., Jiang, Y., Zhao, R. and Wu, Y. (2015). Excess integrins cause lung entrapment of mesenchymal stem cells. Stem Cells 33(11): 3315-3326. Wu, Y., Ip, J. E., Huang, J., Zhang, L., Matsushita, K., Liew, C. C., Pratt, R. E. and Dzau, V. J. (2006). Essential role of ICAM-1/CD18 in mediating EPC recruitment, angiogenesis, and repair to the infarcted myocardium. Circ Res 99(3): 315-322. Wu, Y. and Zhao, R. C. (2012). The role of chemokines in mesenchymal stem cell homing to myocardium. Stem Cell Rev 8(1): 243-250. How to cite: Wang, S., Madsen, C. D. and Wu, Y. (2018). Measurement of Mesenchymal Stem Cells Attachment to Endothelial Cells. Bio-protocol 8(6): e2776. DOI: 10.21769/BioProtoc.2776. As regarding for protocol of isolation of stem cell from cord tissue by mixed explant and enzymatic method (trypsin ).,Iam work by this protocol yield many many cells and doing sub culture to passage 6 but when do characterization by flow cytometry (BD accuri) Iam found CD 45 N(range from 70- 90% ) but all positive marker on cell is low(CD 105 range from 20-35%),(CD 70 range from 33- 45%), (CD 146 10-19%).I dont know why a positive marker is low in comparison to negative marker. thank you for good teem bioprotocol. Thanks a lot for your question. I am very pleasure to share my opinions. From your statement, I think your cells are not purified and most of the cells are blood cells (leucocyte). When you culture these cells, are they attached to the plates and spread well? When I isolated stem cells from cord, adipose and placenta tissues, I usually seed around 10 million cells in a 10 cm plate. Then I remove at least half of the suspension after 24 hours and add the same volume of fresh medium. After that, I change medium every three days till around 2 week. At this time we can see that there are some colonies formation but nearly no blood cells. When the colonies are big enough, trypsinized and expand the cells. When the cells are enough, we can do FACS analysis and detect different markers. Good luck and hopefully it can help you!